My mom and dad performing in their wedding ceremonies. My parents’ marriage began with a leap of faith. My mom and dad could have unknowingly passed each other dozens of times in the streets of Madras, India before formally meeting in May of 1988. But the two never met in Madras, both of their hometowns, and instead in Los Angeles, as planned. Let me back up a little bit. My maternal grandpa worked in America for many years, cherished his time here and often told my mom and her siblings about the great opportunities America offers. My mom’s siblings moved to America to start their new lives, and my mom made the 20-hour trip to see what all the fuss was about…and wasn’t impressed. She spent the next two years back in India, bored without her siblings and willing to go back to America to be closer to them. When my grandparents on my dad’s side met my mom and suggested she go to California to meet my dad, she took a leap. My mom first stopped in New Jersey where her sister was living, and together they flew to California and met with my aunt’s friends. It was at the friends’ house that my mom and dad first met. He introduced himself with the same name as my mom’s brother, sparking years of muddled confusion. But that’s another story. The group paid a visit to San Francisco, my aunt and her friends driving in one car, and my mom and dad driving in my dad’s all-too-classy white Nissan Sentra. He sure knew how to impress a girl. I imagine my mom sitting far back into the seat, resting her hands in her lap, as she always does, and my dad constantly checking his mirrors and sides as he always does. They spent the day driving to the sound of their small talk, which was probably strangely comfortable. “When did you both decide you’d get married?” I asked my dad recently. Three months later: my mom and dad were married in (simplified) Indian style. And they’ve been together for those 26 and a half years. Arranged marriages do not always go so smoothly, as I have seen in a few extended family members’ situations. My parents are lucky, to say the least, for finding mutual companionship. My mom could have said no — the worst misconception about arranged marriages is the notion that parents force marriage upon their children, offering them no choice but to obey. That couldn’t be further from the truth, at least for my parents. When my mom came over to the States, her parents and siblings undoubtedly had hope that she would meet my dad and want to spend her life with him, but they didn’t have any expectations. Her ticket wasn’t one-way. It was just a leap of faith. So no, they weren’t high school sweethearts, and no, they didn’t meet serendipitously in a big city or on top of the Empire State building. Their love story won’t be replicated on a Hollywood screen (though Bollywood has made many fair attempts). Their marriage captures the kind of love that stems from trust and commitment. So when people (often) ask me, “Do your parents even like each other?” the answer is yes, they are in love, their own definition of love – even though their meeting isn’t the same as Harry and Sally’s. It all started with a leap. 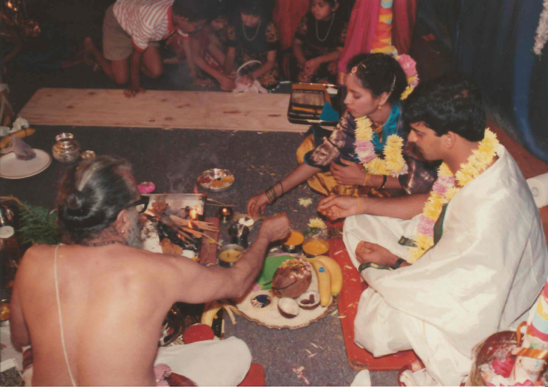 Left: My parents exchanging garlands as part of Indian ritual; center: My mom cheesin’ on her big day; right: My parents throwing rice as part of the wedding ceremony. This column was originally posted on thecspn.com. Categories: Inner Voice, Posts | Tags: arranged marriage, Indian, parents, wedding | Permalink.